Remember the bit about our feet having 33 joints each? And the other bit about how we rarely use all those joints because our feet are often casted in shoes, walking on flat uninteresting surfaces, or not moving at all? 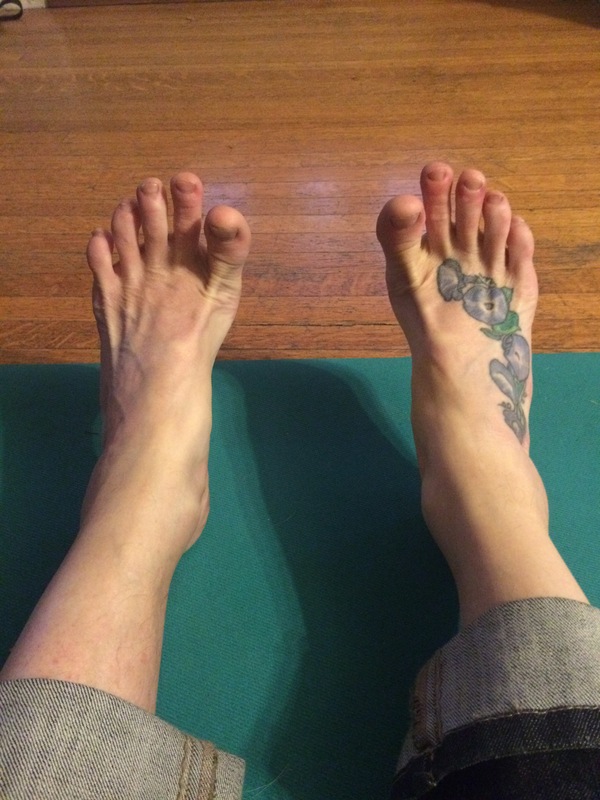 This exercise, Barbie Foot, is great for mobilizing your foot joints, improving blood flow (aka tissue food) and cellular waste removal, maybe even lowering your blood pressure! A video of Barbie Foot is available on my Facebook page. Sit on the floor with your legs extended out in front of you – in Dandasana for the yogis/yoginis out there. If you are not used to sitting on the floor, it may become fatiguing or otherwise uncomfortable, so try sitting with your back against a wall or on a bolster or stack of folded blankets. Place your hands on the floor alongside your hips for additional support, or, if you are working on sitting on the floor unsupported (you are, aren’t you? aren’t you?? ), you can place your hands in your lap. Your feet should be in the same lines or channels as your pelvic bones (aka hip bones) – in other words, not too close or not too far from each other. 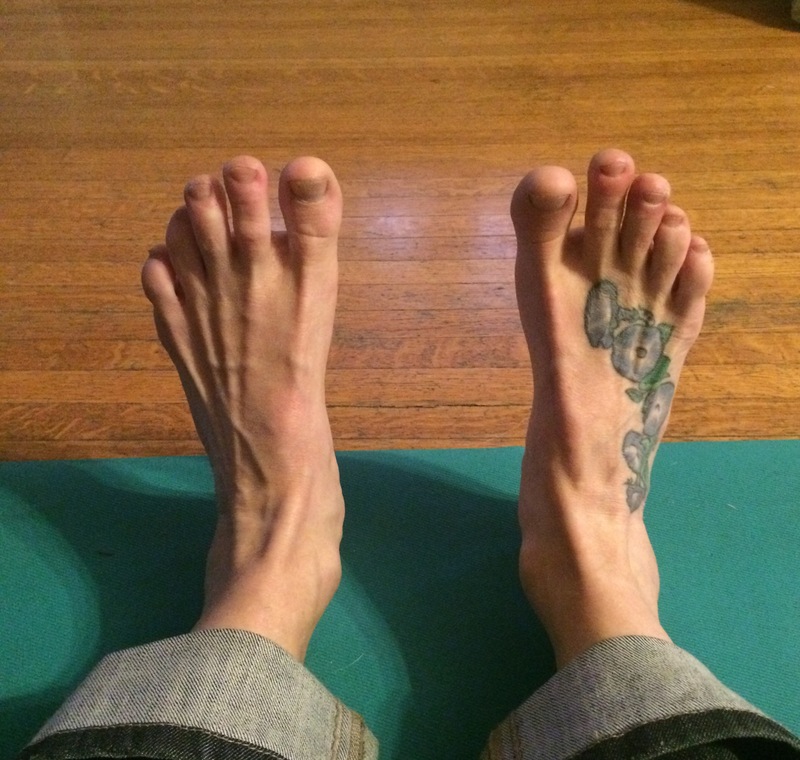 Start with vertical feet so that the tips of your toes are facing the ceiling. Your feet will be in the same position as if you were standing. This is also called dorsiflexion of the ankle. Press the balls of your feet forward but keep your toes pulling back towards your shins. This is a plantar flexion of the ankle, but without the toes going forward. The joint articulation in the ankle is same as if you were “pointing your toes” only in this position the whole foot points forward except for the toes. Return to Foot position 2, balls forward with all the toes coming back towards shins. Bring your foot back to the starting position and repeat. Here is the flow, starting from a neutral, dorsiflexed ankle. Move slowly, lingering in each position. The whole point is to articulate the joints in your feet through their full ranges of motion. So what was that about feet and blood pressure? In a nutshell, when your move your feet (or any part of you), your muscles cause the blood that is moving under pressure through your arteries to move into your arterioles and on into your capillaries where it nourishes tissues. This opening of the capillaries will lower the pressure of blood flowing through your arteries and will save your heart from having to work so hard. True story. 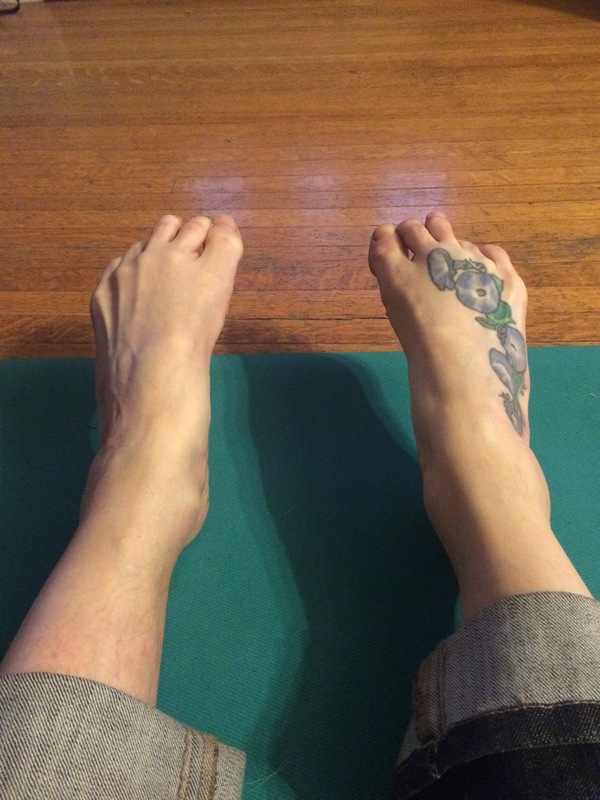 This entry was posted in Feet and tagged foot exercises. Bookmark the permalink. For those who participated in the PNWU Run For Your Life 5K Run Health Fair, you may want to consider these socks as a way to care for your feet after this and any run.